A Sydney man terrorised and threatened with charges of being a terrorist, [scapegoat for the Coalition of the Killing's resource war's in the Middle East], has now been charged with threatening staff from the Department of Foreign Affairs and Trade (DFAT). In Sydney's Central Local Court yesterday, prosecutors added the charge of threatening serious harm to a Commonwealth official. But words are spoken and a word my friends is not a deed. A word is a word. That is in fact if there is any evidence that the wrong words were spoken by Zeky Mallah. Well how dangerous is this government? What did (DFAT) do to wind this man up? Can you believe the Australian authorities at a time when they have lied about our National Security time and time again? I don't think so! Their integrity is SHOT! Zeky Mallah is entitled to his wisdom to learn the difference between wrong and right at 20 years of age. Cross-cultural differences in a tolerant society. But the authorities risk this man a 'brain injury' in a supermax prison at the High Risk Management Unit at Goulburn because he spoke. Make sense? UK: The first of the Muslim detainees released from Belmarsh high security prison after being held on suspicion of terrorism has told the Guardian his fellow prisoners are suffering such severe mental problems that they constantly consider suicide. In his first interview since being released from the jail, after judges said there was no evidence that he was a terrorist, detainee, [prisoner], M said being held without charge and without limit of time has made his fellow prisoners "crazy". "Their situation has become very, very difficult for them," he said. "Three or four of them have become mad, exactly mad. They can't control themselves, they are not thinking in a good way." In documents tendered to the court, the prosecution alleged that some time in November or December last year, Mallah threatened to enter the DFAT headquarters in Sydney and kill unidentified office members. Sounds more like conflict resolution to me not the right to lock up a young man in solitary confinement in a place where, as Bob Carr puts it "people are cemented in". The documents showed the threat was revealed after an undercover police operation. Everyone knows this is government propaganda and any threat imposed by this young man for what ever reason is disproportionate to the facilities and resources of the Howard's lying government. Mallah is due to face a committal hearing in July. 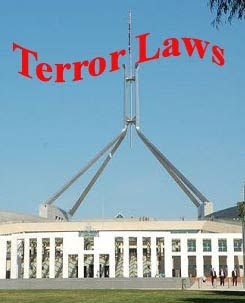 GO TELL HOWARD ON THE HILL IN CANBERRA TO LET INNOCENT PEOPLE GO! THIS IS A SHAM AND A SHAME AND A VIOLATION OF HUMAN RIGHTS.